The World's best selling eCommerce point and click (WYSIWYG) content management solution for online merchants and retailers - ShopFactory! 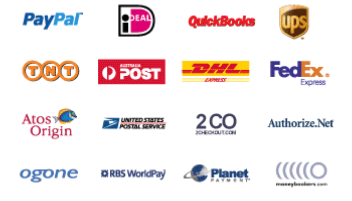 Designed for use by Canadian online merchants - includes multi-language support for English and French. Great for small, medium and large businesses looking to sell products and services online fast, easy and affordably! Multi-award winning ShopFactory is one of the most powerful eCommerce software solutions available today. Building an online store has never been this easy! With ShopFactory - you can build successful e-commerce stores with integrated shopping cart functions. You can provide your customers with a complete, professional, safe and secure shopping environment without the traditional cost. It's THE faster way to sell online. No programming skills required. 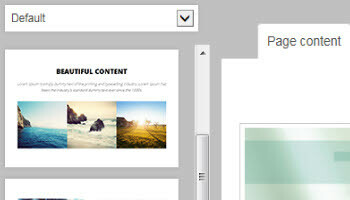 Build your website in a point-and-click editor - right on your own PC! Just add your content, products, set-up your shipping and taxes, and upload / publish to your website hosting. After that, it's easy to make changes and upload them in a matter of seconds. Try resizing your browser window to the right or left so the broswer window is about five inches wide - you'll notice the content on this website reponds and resizes. This is what mobile compatibility and responsive web design means! It's built in automatically for you, no extra work required! The new ShopFactory Block Editor offers Drag and Drop content blocks for rapid design and website layout deployment. It offers unlimited web design capabilities! Quickly access, modify and save HTML and CSS componants in blocks - ON THE FLY. Great time saving feature for Developers and novices alike! NEW - Choose and update icons quickly and effortlessly. 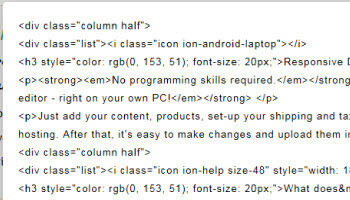 Add icons to your layout, and format your text content to highlight features and important information on your website! Along with the Content Block Editor, ShopFactory comes loaded with merchandising, product and page layout options. Choose from many layout and navigation style options to suit your specific business needs! Secure shopping cart and check-out features integrated! Complete with loads of online merchant features and cart options. Offer discounts, vouchers, gift cards and more! Accept payments online and have your orders automatically processed for payment right to your bank account. 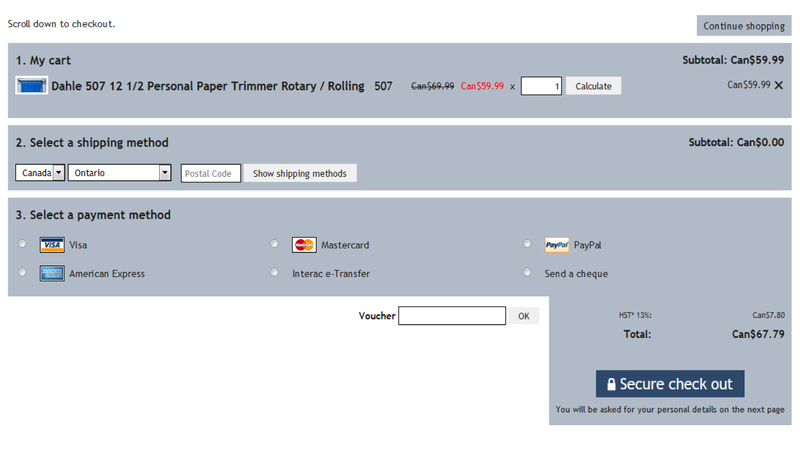 Shipping providers are also integrated for real-time shipping rate calculations for your customers! ShopFactory is search engine friendly and helps you with top search engine optimization- right from the start! Be found on search engines and increase sales! Successful shopping cart users around the world have proven ShopFactory's eCommerce success - because it's simple, fast and easy to use. A complete small business ecommerce solution for both USA and Canada! Canadian Taxes Compatible, Multi-language Support in both English & French, and much more! Did you know - Online Shopping is a dramatically growing trend in Canada. Has your business examined promoting your business online to take advantage of the growth potential for ecommerce in Canada? It's LESS expensive than you think, and now it's easier than ever before. If you can use MicroSoft Word or any other windows program, you can start selling online with ease. If you need assitance or guidance when deciding on an online shopping cart solution - we can help YOU avoid the pitfalls - please Contact Us! ShopFactory is the #1 choice in shopping cart software and web design solutions for Small Office / Home Office (SOHO) eCommerce. It also fits in with medium and large size businesses needing a complete package!